If I had a time machine with a full tank of gas, I’d do a bunch of things, but before I took it back to the rental place I would take it for one last spin back to July 23rd, 2014—just a few weeks ago. I was fishing the Bobr, a beautiful freestoner in the Karkanoszy Mountains of southwestern Poland, not far from the Czech-border, where I totally and utterly blew up my chance at my best fish in at least two years. We were staying at the lodge of my friend Igor Glinda, in front of which a high bridge spans the river. One morning Igor interrupted breakfast to tell us that the biggest fish he had seen in at least six months was underneath the bridge eating nymphs. In the few minutes it took me to wader up he had a name and a backstory. I tied on a size 12 Hare’s Ear and went to meet Stanislaw. It would not be an easy feat. Due the depth of the water behind the bridge, the only possible presentation was from upstream–a hiding spot behind a pylon. I was so preoccupied with presenting from this position and getting him to eat that I didn’t take into account the fact that in order to stick the fish properly I would have to get on my toes, lift my rod over the bridge pylon and reach my arm behind the fish for a sweeping downstream hookset. In any case, present I did. He ate, I struck, he was there, he was gone. Afterward I sat on the bridge and thought not only about my hookset, but about all those other things that would have had to go right for me to land the fish. There was plenty I hadn’t taken into account. Getting the presentation right to a wily trophy fish is hard enough. I sat down and, with a deep and sorrowful breath, made a checklist of all those things I have should have thought about. The first thing to consider is your plan for playing the fish. What section of water represents your best chance to land this fish, and what can you do during the first few seconds of the fight—those first few seconds when hopefully the fish is more stunned and surprised than you—to dictate to the fish, if not the length of the battle, then at least the battle’s venue? 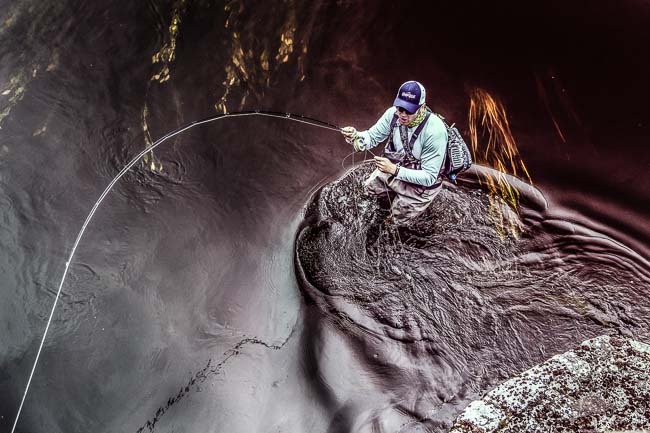 It’s worthwhile to also identify no-go zones—those points of no return where, if your fish surges, you’re prepared to push your tippet to the breaking point. You should have a best case scenario in mind and a worst case scenario. The best case scenario for landing a fish will hopefully be adjacent to your ideal battleground. It will also ideally have some slack or slower water that will aid in your ability to guide a large fish into the net. But it’s always a good idea to have a look downstream just in case things get away from you. Double-check your connections. Are you using very light tippet? What’s the heaviest you can get away with? Will switching over to fluoro get you one more crucial pound? Maybe your weakest connection could be improved by an improved Alrbight or blood knot. Have you checked for abrasion? Better to retie. How about your hook point? Has your nymph been scraping stones all day? Is it time to resharpen or swap out? Where and how does your hookset need to happen? Are you making a presentation from upstream? If so, what rod motion are you going to use to make sure you get a downstream hookset and not simply pull the hook out of the fishes mouth? Maybe you’re swinging a spey fly or mouse, in which case you should do absolutely nothing until you feel the weight of the fish. Tell your nerves in advance what they need to do so they don’t react incorrectly. Humility is what allows you to conceive of a checklist in the first place. This is important, and should probably be at the top of the list. It’s the one thing I most lacked before my encounter with Stanislaw. In fact, before presenting to him I made the observation, that I had to that moment hooked and landed every one I had fished to that day. Is the mental preparation needed to tango with a monster fish complicated? A little. But there are some fish you are only going to encounter a few times in your life. Moving slowly, methodically and deliberately means that, when they finally do invent a time machine, you won’t need to use that last quarter tank to right past piscatorial wrongs. You can see Hendrix, hang out with Vikings, bet on the Spurs to win it all. Leave the fishing for the here and now.